We’d love your help. Let us know what’s wrong with this preview of Freed by Flame and Storm by Becky Allen. Jae used to be a slave, laboring with the rest of her people under a curse that forced her to obey any order she was given. At seventeen, she found the source of her people’s lost magic and became the only person to break free—ever. Now she wants to use her power to free the rest of her people Revolution is nigh, and one seventeen-year-old girl stands at the head of it all. 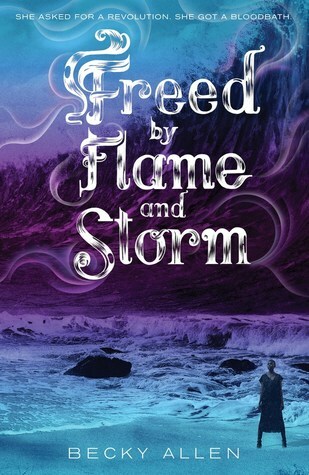 To ask other readers questions about Freed by Flame and Storm, please sign up. Bound by Blood and Sand was one of the most thought-provoking, brutal desert fantasy novels that I've read. I really enjoyed it, which was great because I'd had high expectations for the book. It was intriguing and complex, and there were cruel and heartbreaking aspects of the book that made it even more powerful and intense. I have been eagerly awaiting this book, as it is the sequel and conclusion of the series. Unfortunately I struggled with getting into the book, but overall, it is a good conclusion novel. Freed by Flame and Storm picks up with Elan and Jae fleeing, trying to get to someplace safe so they can regroup and plan, in order to save the Closest. They run into expected allies - the Order, a group determined to topple the Highest. Their goals align, and so they accept the Order's help. The fate of the Closest rests on Jae and Elan's shoulders, and this means that difficult choices must be made. A former slave girl and a traitor boy with no last name - they will right wrongs, or send the world into chaos. This book seemed to deal more with consequences - consequences of Jae obtaining so much magic, consequences of Elan defecting, consequences of trying to break the Curse that binds the Closest. It wasn't a brutal, cruel read like its predecessor, but it was harsh in a different light. There was a lot of subtle politics at play, as well as scheming and betrayal. Jae has to be strong enough for hundreds and thousands of people, and she proves her strength over and over in this book. She isn't perfect and she has plenty of insecurities, but she does what she thinks is good for all, and her instincts are sure. Jae is an easy character to like and root for. Elan as well. I liked him the most, of all of the characters of this book. He is so kind and compassionate, and very driven and selfless. It was cool to read from Erra's POV, in addition to Elan's and Jae's. The entire book is written in third-person, but limited to specific POVs. Erra becomes a very important person in this book (both in a good way and bad), so it was neat to read her perspective. Also, props for all of the diversity in this book. Jae is dark-skinned, Erra is gay, and Erra has a very cute but also star-crossed romance going on. The plot meandered and honestly it took entirely too long to get to The Point of this book (I'll talk about that in the next section), but I will say that the ending was a good one. I half-expected a non-HEA but the ending works for the series. It's a good one for Jae, for Elan, for the Closest, and even for the Highest. Series ending should be more like this (in my opinion), with a good balance of "good" and "bad". My biggest complaint about this book is that is sooooo boring. I had the hardest time reading it. I usually try and review books a month in advance. There are about two weeks left before this book publishes and I'm only now reading it and posting a review. It took me so long to get into the story. Every time I picked up the book, I couldn't get into it. Nothing was holding my attention. This book had a completely tone compared to its predecessor. I couldn't remember much from the ending of the previous book, so that was a drawback too. It might have helped if this book was shorter. It felt like the plot wandered this way and that way and didn't get to the point. Halfway through the story, the Closest are released. I was like, shouldn't this be the ending? But in the second half of the book, the author tries to show us the consequences of releasing the Closest. Honestly I was so bored from the start, by the time I got to the Closest being freed from the Curse, I wasn't riveted or excited or anything. I started skimming fairly early on and kept flipping. Nothing was holding my attention, and so many pages were filled with useless drivel. I hate to say it but this book could have been condensed to maybe 100 pages or less. So much of it didn't seem to have a purpose (to me as a reader). This was incredibly disappointing because I had no issues with getting through Bound by Blood and Sand. But this book really tried me. I fell asleep while reading it no fewer than five times, and it took me days to read it (whereas usually I'll read a book in one sitting, regardless of how "bad" or boring it is). This book wasn't "bad", but it was unfortunately very boring. All of that being said, I'm half-in, half-out in terms of putting a recommendation out there. I loved book one but really didn't enjoy book two (mostly because the book is boring). I'd say don't bother with the series if you haven't started it. But if you've read the first book, definitely finish the series. But this series isn't an enjoyable one overall (with book two being so much weaker than book one). It's not a series I'd recommend a person binge-read. 2.5 stars -> rounded up to 3 stars. I wish I had enjoyed the book more, but the plot just didn't hold my attention. In general it wasn't a bad book and the story certainly did the job in terms of wrapping up the series, but the book could have been way shorter, based on what was presented. I struggled so hard with this book and it's a terrible feeling, so I'm going with this rating. I may try some of the author's new books in the future, but I'll definitely be more wary than before. Okay, I read this book right after the first book... I couldn't help myself. In lieu of writing a big review (which I did for the first book) I am going to keep this one simple, since there are 6 more months before it comes out. This book picked up where the last one ended, and not much has changed. Jae and Elan are still trying to figure out where the knife, that can end the Closest oppression, is or even how to destroy it. As they get closer into the city, they find unexpected allies, enemies, Okay, I read this book right after the first book... I couldn't help myself. In lieu of writing a big review (which I did for the first book) I am going to keep this one simple, since there are 6 more months before it comes out. This book picked up where the last one ended, and not much has changed. Jae and Elan are still trying to figure out where the knife, that can end the Closest oppression, is or even how to destroy it. As they get closer into the city, they find unexpected allies, enemies, and friends. I really liked seeing Jae's growth after what happened in the last novel, and Elan definitely continues to grow and learn as a character. I want to point out that the success of this story isn't because Allen came up with a whole new original story. That's been happening lately, only to make readers annoyed that these "original" tales are much like a tossed salad of other stories melded together. Allen keeps her story simple, she doesn't overreach with flashiness, and the end result is something all her own. Not completely original (oppressed people vs the elite) but her story telling built a whole new set of characters in this tale as old as time. Oh hey - I wrote this! And it's out now! FREED finishes the story begun in BOUND BY BLOOD AND SAND. Jae now has full control of her magic, and has sworn to use it to free her people -- but she knows doing so will spark a war, and those same people may well end up slaughtered. She never asked to be a leader, but now she holds the fate of thousands in her hands. Meanwhile Elan, who walked away from his family, must face the consequences of that decision when he faces his own sister in battle. Basic Oh hey - I wrote this! And it's out now! An enjoyable and satisfying conclusion to this duology! I especially loved seeing more of the worldbuilding & magic system--it's different from other fantasy books I've read but also wasn't overwhelmingly complex for my tastes. I loved it. Absolutely loved it! I thought it was a very fitting sequel and I hope the author continues to build stories in the world she has created. So, I didn't like this one as much as the first book. I had some issues with the beginning and middle, but loved the ending. Overall a good duology, with interesting characters. I will be keeping my eye on more books from this author. This was a satisfying finale. After the events of the last book, Jae and Elan are trying to free the Closest for real this time with the potential of war on their heels. While reading, I found that the story was slow, but the pacing was fast? I mean, I found in no time I was on chapter 10 yet it felt like I was trudging through the story. However, I was having fun with the events that were happening. Jae in this installment was amazing, more so than in book one if You can see my full review here! However, I was having fun with the events that were happening. Jae in this installment was amazing, more so than in book one if I'm honest. She made the tough choices, especially in the end and stayed consistent throughout. And by her side was Elan, loyal till the end. We meet some side characters, returning characters make an appearance and I liked the majority of them. Overall, this finale was well worth the wait. I loved Jae's story so much. This was such a non-stop adventure full of twists and turns I never saw coming. Excellent job, Becky! I stumbled upon Becky Allen’s first book in this duology, Bound by Blood and Sand, last year and fell madly in love with Jae and her quest. The underlying plot (oppressed people versus the upper class with power) is I loved Jae's story so much. This was such a non-stop adventure full of twists and turns I never saw coming. Excellent job, Becky! This book picks up right after the first book ends. Jae and Elan are on a quest to free the Closest. Jae has recently freed herself from the dreaded Closest curse and knows in her heart of hearts she can free everyone else. Their quest is dangerous but necessary. Along the way, new characters are introduced that will change the course of the this battle in ways nobody could see coming. There are a host of new characters introduced in this story but all necessary. I won’t give away who they are and what position they hold as you’ll need to get the book to find out for yourself. 😉 What I can tell you is that you should not trust what every says and don’t always believe what you read. Everyone is trying to either save themselves or protect someone else. The plot was a non-stop action packed ride! Allen started the action right out of the gate and never let up until the very end. She did a wonderful job of keeping the reader (me) in this world she created. The way Jae weaved her magic and how she was able to summon it was so well done. I’m not a big super huge high fantasy reader and I don’t feel this was a high fantasy read. It was just enough fantasy and just enough of everything else to be the perfect balance. It was not over complicated and I liked that. No love triangles (WOO! ), no instalove, no confusing names for people/places/things that caused me to stumble every time it was mentioned. Like the last bowl of porridge for Goldilocks, it was just right. Really pleased the author kept this as a two-book story, and that THANK GOD there wasn't a love triangle. Well-written, with great world building that never dove too deep into the weeds but wasn't shallow either. No crazy reveals; just lots of good story that builds and builds upon itself. Best of all, characters don't stupidly hide crap from each other for no reason. At no point did I yell "if they would just TALK to each other there would be no problems!" the way so many other books in this vei Really pleased the author kept this as a two-book story, and that THANK GOD there wasn't a love triangle. Well-written, with great world building that never dove too deep into the weeds but wasn't shallow either. No crazy reveals; just lots of good story that builds and builds upon itself. Best of all, characters don't stupidly hide crap from each other for no reason. At no point did I yell "if they would just TALK to each other there would be no problems!" the way so many other books in this vein tend to make me do. As Jae’s world explodes into revolution, new factions and new problems emerge in this very exciting sequel. I really loved how the world expanded, involving new characters & shifting loyalties. The multifaceted ways that the privileged and the oppressed struggled with each other was refreshingly realistic, & the slight mentions of romance were neatly done. A powerful story about the power of social justice. I can't review this objectively, since Becky is one of my closest friends, but as someone who was part of the workshopping progress for the first book in this series, I found it thrilling to get the chance to read this sequel, falling back into the familiar world and characters but following brand-new and surprising plot developments. A lovely reading experience in every way. by Becky Allen Another home run. Freed by Flame and Storm was an absolute page turner. Jae the go to Savior. Many trials come her way which push her to the limits. This series is a definite favorite. Thank you, Becky! Good fantasy novel. A second book in the series that can be read as a stand alone novel. Liked the story and how it all ended. Sometimes it good when an author doesn't prolong a series. Gorgeous storytelling and a very believable plot line. Highly recommended. Not as compelling as the first one. Amazing. I couldn't put the book down. It has 323 pages, and I read it in a week.